The Christian presence in 1892 was much more obvious in Downtown Vancouver than it is now. City of Vancouver Archives. 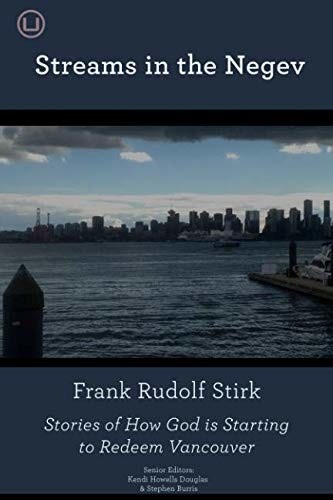 The following is excerpted by permission from Frank Stirk’s just-released – and long-awaited – book, Streams in the Negev: Stories of How God is Starting to Redeem Vancouver (Urban Loft). As soon as a search of the City of Vancouver Archives turned up this photograph, I was captivated by its symbolism. 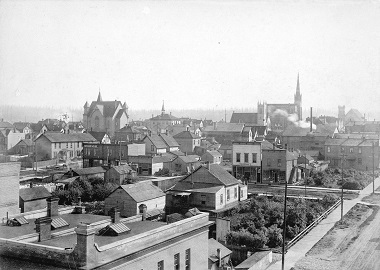 The photo (actually two photos combined to give a panoramic effect) looks south from the intersection of Hastings and Seymour streets toward Pender Street in 1892. What is immediately noticeable is the visible Christian presence, including four churches. From left to right, according to accompanying notes, they are: Homer Street Methodist Church, the tower of Holy Rosary Church, the spire of St. Ann’s Academy (a Roman Catholic school), the spire of St. Andrew’s Presbyterian Church and the tower of First Congregational Church. It’s been more than a century since churches and crosses atop steeples were so prominent in views of Downtown Vancouver, and those days are probably gone for good. But here is what fascinated me about this old photograph: The sight of churches in the Downtown peninsula may have all but vanished apart from several heritage buildings; and yet the area actually contains more churches now than at any point in its history. The difference is that these newest ones are not located in their own stand-alone buildings but are instead woven into the very fabric of the community. Westside is alone among the newer churches to actually own a building, but even it was originally built in 1995 as a performing arts theatre. In other words, while the Church is returning to the peninsula, its presence is not immediately obvious to the people who live and work and visit there. And yet there they are: churches that are hidden in plain sight. And that’s a good thing, because churches in buildings are no longer the focal point of community life as they once were. Today most churches must struggle with a secular culture – and Vancouver is intensely secular – that sees them as out-of-date and irrelevant and perhaps even a social threat. They barely figure in community planning, for example. The reality therefore is that Christians whom God is calling to serve in Vancouver must disavow any expectation that people will come to church on their own, although it can and will happen, and instead seek by every legitimate means possible to bring the gospel to them. If one were to measure the transformational impact these churches are having by Sunday worship and small group attendance and the number of baptisms alone, the results to date could be worrisome. The bottom-line question is how many people, usually millennials, are actually coming to Christ through these new Downtown churches – how many are new converts to a transformed life, and how many had made some kind of previous faith commitment but had left the Church for whatever reason and are choosing to return. Or both. But Marlon Brown, the pastor of Awake Vancouver – now relocated to South Vancouver – thinks what’s really needed given how resistant and ignorant most people are toward Christianity is something a lot more basic. Churches have been a rare commodity throughout Vancouver, most of the attempts at planting churches in Vancouver came to nothing. As you read this book, you’ll see God has better things in mind for Vancouver. In Vancouver – a spiritually “drought-stricken” city there is “a sudden rain” of God’s grace starting to penetrate its hard, sunbaked soil, and new life is breaking through. This book will be interesting and useful for anyone who cares about the health and growth of the church in Vancouver. Frank Stirk was a journalist for over 40 years. Now retired, he lives in North Vancouver and attends Cityview Church in Vancouver.